Susy Jack has been wanting to put her spin on modern decorative arts into temporary tattoo form for a while now, and Valentine's Day seemed like the perfect opportunity! 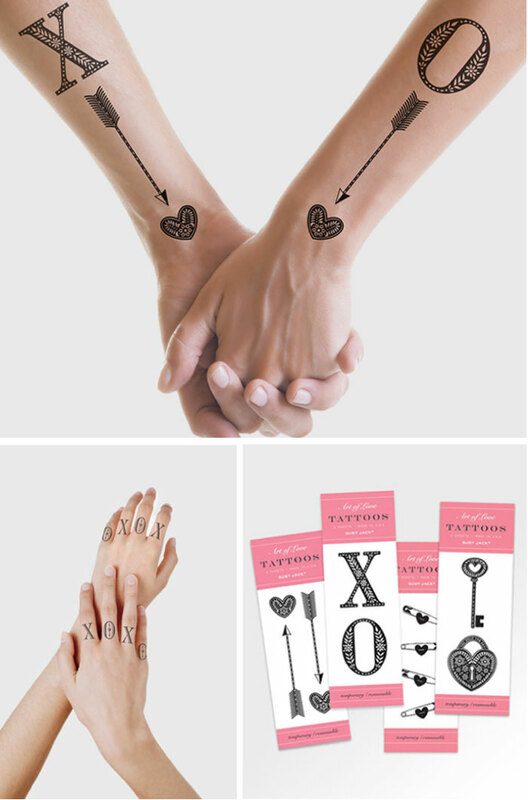 Her brand new Art of Love series features six styles of classic black tattoos - four illustrated sets and two knuckle sets! Wearable and share-able these tattoos were created to look real, inspired by the great tattoos Susy sees on the daily commute to her Bushwick, Brooklyn studio, and by her love of creating new avenues for "decoration". They're perfect as a quick gift on their own, or for tucking into a traditional card. We also love them as an edgy addition to the wedding category. Each package contains two sets of tattoos. I absolutely adore these - hoping to snag some in NY somewhere at the end of the month. She's so clever!